Additional Hi-C interaction matrix correction algorithm ‘Knight-Ruiz’ as a C++ module for a faster runtime and less memory usage. New options for hicPlotMatrix: –loops to visualize computed loops from hicDetectLoops and –bigwigAdditionalVerticalAxis to display a bigwig track on the vertical axis too. This bug fix release patches an issue with cooler files, hicBuildMatrix and the usage of a restriction sequence file instead of fixed bin size. This bug fix release removes reference to hicExport that were forgotten to delete in 2.2. Thanks @BioGeek for this contribution. restructuring the central class HiCMatrix to object oriented model and moved to its own library: deeptools/HiCMatrix. hicAverageRegions: Sum up in a given range around defined reference points. Useful to detect changes in TAD structures between different samples. hicTransform: Restructuring the source code, remove of option ‘all’ because it was generating confusion. Adding option ‘exp_obs’, exp_obs_norm and exp_obs_lieberman. These three different options use different expectation matrix computations. Extending test cases to cover more source code and be hopefully more stable. The third bugfix release of version 2.1 corrects an error in hicPlotViewpoint. It adds a feature requested in issue #169 which should have been included in release 2.1 but was accidentally not. Small fixes concerning updated dependencies: Fixing version number a bit more specific and not that strict in test cases delta values. The 2.1 version of HiCExplorer comes with new features and bugfixes. Adding the new feature hicAggregateContacts : A tool that allows plotting of aggregated Hi-C sub-matrices of a specified list of positions. Many improvements to the documentation and the help text. Thanks to Gina Renschler and Gautier Richard from the MPI-IE Freiburg, Germany. supports only bigwig files for an additional data track. checks if all characters of a title are ASCII. If not they are converted to the closest looking one. One call instead of two: hicFindTADs TAD_score and hicFindTADs find_TADs merged to hicFindTADs. New multiple correction method supported: False discovery rate. Call it with –correctForMultipleTesting fdr and –threshold 0.05. Update of the tutorial: mES-HiC analysis. Added compressed matrices. In our tests the compressed matrices are significantly smaller. This release adds a quality control module to check the results from hicBuildMatrix. By default, now hicBuildMatrix generates a HTML page containing the plots from the QC measures. The results from several runs of hicBuildMatrix can be combined in one page using the new tool hicQC. Also, this release added a module called hicCompareMatrices that takes two Hi-C matrices and computes the difference, the ratio or the log2 ratio. The resulting matrix can be plotted with hicPlotMatrix to visualize the changes. Our #biorXiv preprint on DNA sequences behind Fly genome architecture is online! In this article, we introduce HiCExplorer : Our easy to use tool for Hi-C data analysis, also available in Galaxy. We also introduce HiCBrowser : A standalone software to visualize Hi-C along with other genomic datasets. Along with these resources, we present an analysis of DNA sequences behind 3D genome of Flies. Using high-resolution Hi-C analysis, we find a set of DNA motifs that characterize TAD boundaries in Flies and show the importance of these motifs in genome organization. We hope that these resources and analysis would be useful for the community and welcome any feedback. 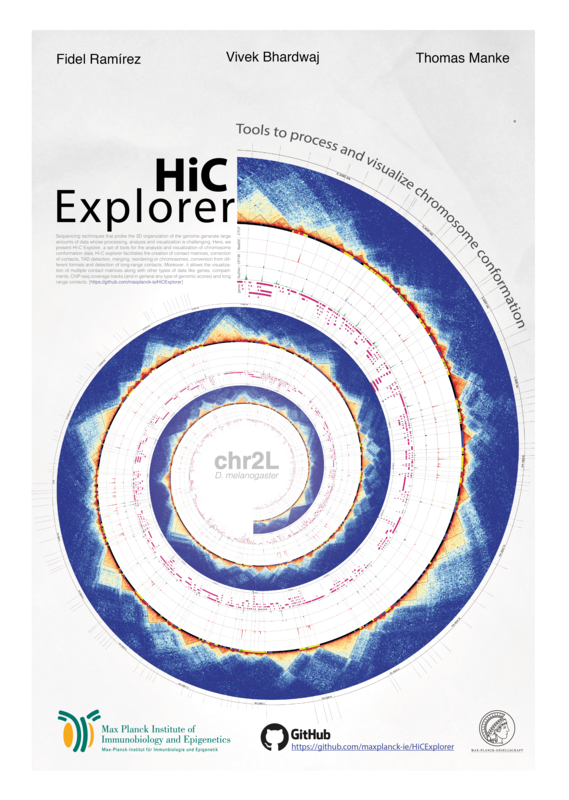 We are excited to announce that HiCExplorer has won the NVIDIA Award for Best Scientific Poster in VizBi2016, the international conference on visualization of biological data. © Copyright 2019, Fidel Ramírez, Bjoern Gruening, Vivek Bhardwaj, Joachim Wolff, Leily Rabbani Revision dc049b9a.